This vote had no black and white winner, and rather than making the judgment call ourselves, we’re going to tell it like it is. Kinja Co-Op and the Kinja discussion platform as a whole are open to anyone. We want writers, readers, brands, experts, celebrities, and assholes participating in the conversation. We’re happy to see Razer’s social media team mobilizing its readers to vote, and we can’t ignore the fact that those Razer fans are passionate enough about their gear to register for Kinja just to vote. 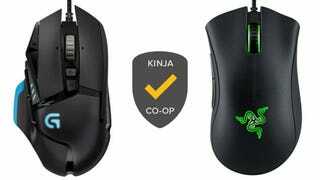 In that scenario, the Razer DeathAdder won handily in 2013 and again this year. At the same time, one of the reasons our product votes are so great is because our Kotaku, Gizmodo, and Lifehacker editorial staffs have built an amazing audience of product savvy and product passionate readers, and were the vote open only to our regular readers, the Logitech G502 Proteus Core would win handily, a fact also backed up strongly by which deals our readers tend to take advantage of. Therefore, the Logitech G502 is the Kotaku/Gizmodo/Lifehacker choice for 2015's gaming mouse, and the Razer DeathAdder Chroma is the Internet’s choice for 2015's best gaming mouse. They are both great mice.